The most anticipated Design related event of the year is definitely the Salone Del Mobile (also known as iSaloni) which takes place in Milan annually usually in April. This year there will be Euroluce as well which is specialized in everything related to lighting. Read below to check out all the parts of the exhibition and how to make the most of your stay in Milan during this event. 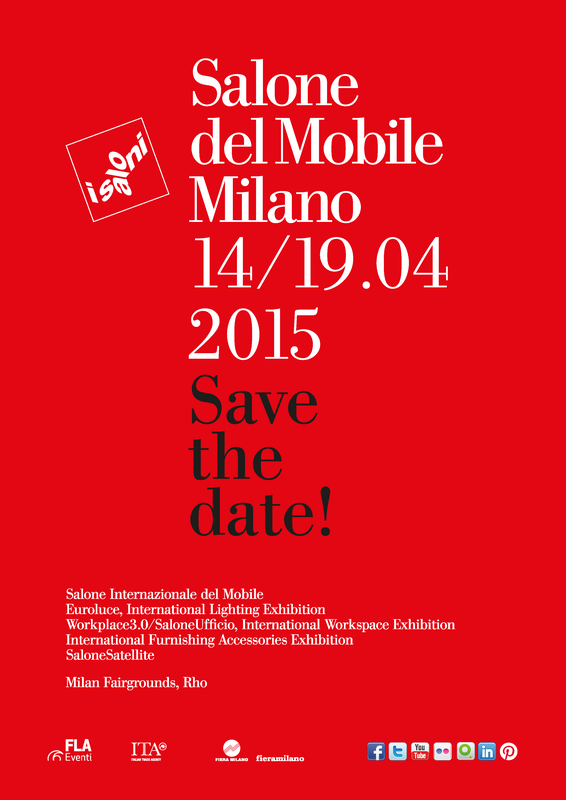 The 54th edition of the Salone del Mobile will fling open its doors from Tuesday 14th to Sunday 19th April, at the Rho Milan Fairgrounds. Quality and innovation, along with major collateral events and a comprehensive, wide range of goods are the ingredients that make the Salone such an unmissable event. With over 2,000 exhibitors, more than 200,000 m2 of exhibition space and thousands of products making their market debut, the Salone del Mobile is the acknowledged sectoral international benchmark event year after year, attracting more than 300,000 visitors from over 160 countries. The Salone is open to operators each day from 9.30am to 6.30pm, and also open to the general public on the Saturday and Sunday. Euroluce, the exhibition devoted to excellence in the lighting world, will showcase the very latest in outdoor, indoor, industrial, event/show, special use and hospital lighting solutions, lighting systems, light sources and illumination technology software and consulting. To mark the 2015 International Year of Light proclaimed by UNESCO, architect Attilio Stocchi has conceived “FAVILLA. To every light a voice” for the city of Milan – an installation/event telling the story of and exploring the essence of light. on exhibit, relating to the product categories on show. The Salone del Mobile can be followed on the social networks and through its website and the online magazine (www.salonemilano.it), its official Facebook and Twitter pages, a dedicated YouTube channel, Flickr gallery and profiles on LinkedIn and Pinterest. Salone del Mobile information points at various focal points around the city will be manned by 100 students, on hand to provide visitors with information on how to negotiate the city, on the trade fair itself and the palimpsest of events in Milan organised by the Department. The Salone del Mobile is also one of the supporters of the exhibition “LEONARDO 1452-1519” – the greatest Leonardo da Vinci exhibition ever held in Italy – which will launch on 15th April 2015 at Milan’s Palazzo Reale, just after the Salone opens. Promoted by the Municipality of Milan, the project was conceived and carried out within the framework of a partnership between Palazzo Reale and Skira going back over more than 15 years, and curated by Pietro C. Marani and Maria Teresa Fiorio – both prominent Renaissance art historians. For the third year running, an agreement between the Salone del Mobile, Milan Fairgrounds and Milan’s transport agency ATM – means that visitors to the Salone will be able to acquire a combined ticket, valid for public transport on Milan’s urban network and for entry to the trade fair. Trenitalia high-speed Frecciarossa, Frecciabianca and EuroCity trains will stop specially at Rho Fiera Expo Milano during the Salone. Frecciarossa and Frecciabianca will make three stops during both the morning and the afternoon, as well as two EuroCity train pairs to and from Switzerland.